Discussion in 'Designers and Collections' started by poison84, Jan 21, 2015. It's very much much deserved. The award is "Designer of the Year", not "Lifetime Achievement", and in this year he was the most relevant name in the industry. Simple. I bet the CFDA Awards were thinking on him too. Congrats to him! It was his year so it's a great and natural choice. It's quite funny to read The Telegraph qualified Frida's Gucci as dated. It was boring sometimes and not groundbreaking but certainly not dated. So hypocritical! It may look premature but i can't think of anyone else this year. I was thinking about the fact that Hedi Slimane never won an international designer award. In 2013, i felt like he deserved it. It would be good if he gets his prize from Tom Ford. there's this short film by Gia Coppola in collaboration with Gucci at Vogue's youtube channel. The clothes look soooo pretty, from the suits to the more theatrical pieces.. they were shot beautifully, and even outside of the context, it just made me appreciate his presence more, the ideas are nothing new but I like this type of dream-like aesthetic and drama in clothes in a time where it's all either trying too hard to be taken seriously or too fast and changeable each season.. Does anyone know when Alessandro's birthday is? Looks like he is doing a pretty decent job! ^If it's Neiman Marcus, it's most probably March. Are fashion editors burning out on Alessandro Michele's vision for the brand? It may not even matter. 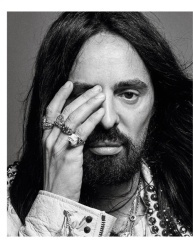 In the roughly two and a half years that Alessandro Michele has served as the creative director of Gucci, fashion observers have been treated to a deep, immersive view of what he finds stylish. A top-line list of his favorites would likely include embroidery, snakes, embroidery of snakes and Jared Leto. Fortunately, if reptiles and method actors aren't appealing to you, there are plenty of other motifs to choose from: Since his debut menswear collection for Gucci in January 2015, Michele has sent a staggering 865 looks down the runway, with an additional 162 spread between two pre-fall collections that were disseminated via digital lookbooks. The number of pieces Michele has shown in his relatively short tenure at the Italian house can be misleading in that, despite the breadth of each collection, Michele's Gucciverse has yet to waver far from the very specific, maximalist aesthetic he has pioneered. The season-to-season similarities are either admirably consistent or mind-numbingly boring, depending on who you ask. If you do ask, you may find many in the industry wondering aloud how long Gucci can remain on top without offering something that feels actually new. "It's a question that always comes up whenever something is successful," says Eric Wilson, fashion news director at InStyle. "What is the storyline, and when is it going to not be successful? That's the natural fashion industry gossip talk: How long can anything last?" Fashion editors may be particularly eager to have this conversation, since they have seen more of Michele's Gucci than most of the population. "There's naturally going to be a cynicism in the editorial world among the people who look at these things on an everyday basis," says Wilson. "But you have to remember, the customer is not getting every press release or looking at every celebrity in a dress. They're aware of it, but they're not necessarily going to be inundated at such a degree that they are going to burn out from it very quickly." Whatever semblance of Gucci fatigue that exists among editors — especially at legacy fashion publications — could possibly be tempered by the fact that Gucci is a major advertiser in both men's and women's books. Money from sponsors is notoriously a motivating force to keep a lid on public griping among those who have privately expressed their readiness for something new from the label. Either way, even positive stories acknowledge Michele's repetition, though it's often framed as an asset, along the lines of "more of the same of what we love" or "predictability doesn’t obviate pleasurability." Ana Andjelic, a luxury strategist, writer and doctor of sociology, says she's also heard other industry figures, including representatives from rival brands, criticize the repetitive Gucci output. "I heard the same thing maybe a year ago," she explains. "I think it's pure jealousy." To be clear, there is much for other brands to be jealous about — Gucci's repeated tropes have resonated with customers in big ways. As Lauren Sherman at Business of Fashion pointed out this week, Gucci is selling better than ever. Sales for the Kering-owned brand were up 43.4 percent during the 2016 fiscal year, Sherman reports, with an operating profit of €907 million in the first half of 2017 (a bit shy of $1.1 billion). For an idea of what sales like that look like for retailers, consider last season's street style favorite, the relatively simple $550 throwback Gucci logo tee. Lisa Aiken, fashion retail director at Net-a-Porter, says the site sold out of that style in about three weeks. "We sold 1,000 units in that period, which is really quite astonishing," she reports. Aiken is confident that consumer interest in Michele's Gucci has not yet peaked, pointing to double-digit sales growth for the brand on Net-a-Porter and other massive numbers, like the 13,000 Gucci Princetown slippers the site has sold during Michele's tenure alone. Net-a-Porter is doubling down on fall's logo T-shirt range, including options customized by the artist Coco Capitan, who scrawled "Common sense is not that common" across the front of one tank top. "We've got 5,000 units [of that piece] coming in," Aiken says. "When you look at that rate of sale, we don't believe it's going to slow down. That 5,000 units might get us to the end of the season." If Aiken's sales forecast is accurate across the board, Michele will, once again, have very little incentive to reinvent the wheel. If anything, Aiken says, he may be proof that customers appreciate familiarity over chasing ever-changing (and ever-more-expensive) trends. "It feels like the collections have a sense of longevity," she says. "It feels like you are investing in pieces, and you know that they're still going to be relevant in one, or two or three seasons time, because that's the perspective the designer is taking." Certain changes that Michele has put in place — combining men's and women's shows, speeding up the brand's supply chain, investing in a digital strategy and revamping e-commerce — are unequivocal wins from a business perspective. But his commitment to a singular aesthetic could be added to that list, too, Andjelic says. "The problem of luxury brands — that Gucci sort of overcame in a sense — is that they target their audience season after season with everything new: a new celebrity photographer, with brand management who wants to change aesthetics time after time and just keep some signature elements," she explains. (The exhaustion among creative teams charged with a constant cycle of breakneck reinvention and evolution is well-documented, too.) Andjelic also mentions that new revenue streams, like Gucci's recent extensions into décor and travel, work seamlessly primarily because the label eschews too much change. "It's fine to have that complete aesthetic look to close the loop when it comes to your brand strategy or brand world," she adds. 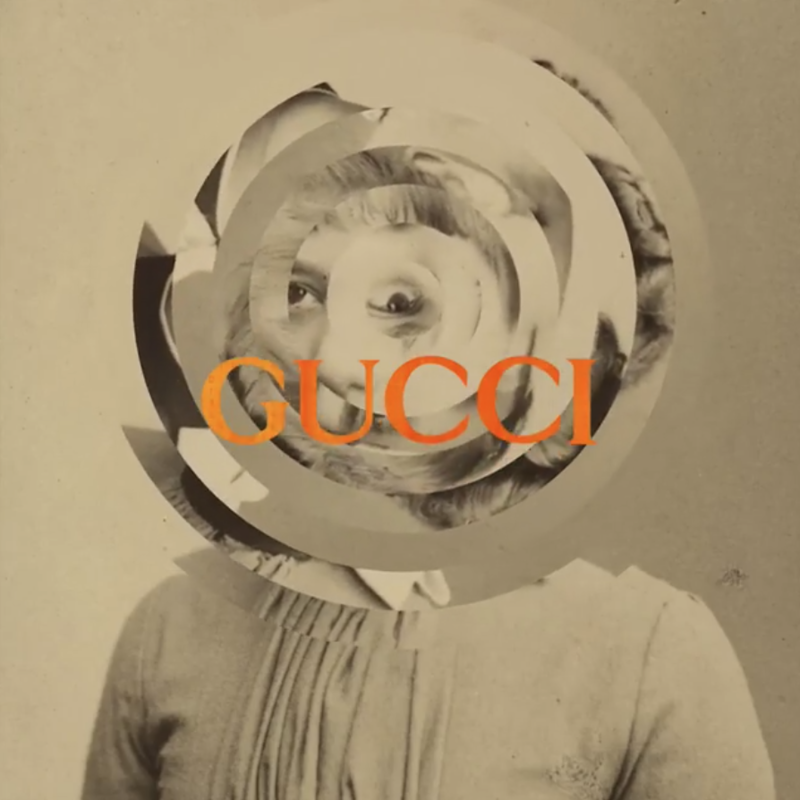 In the end, complaints from within the industry about the relentless Gucciness of Gucci may inadvertently highlight the limited clout of some longstanding fashion gatekeepers. Wilson, for one, says Michele would be wise to heed sales numbers over any fashion media sniping. "Any [designer] that pays attention to what fashion editors think is probably still living in 1992," he says. "Any designer who is basing his judgment on what outsiders think or tell him to do is making a mistake and shouldn't be in that position in the first place." Or, as Andjelic puts it more succinctly, "When consumers are tired of it, that's going to be the end. When editors are tired, who gives a ****?" Steve Dool wrote really good article , and yes, Ana Andjelic nailed it, : "When consumers are tired of it, that's going to be the end. When editors are tired, who gives a ****?" Gucci seems to be repetitive but there are always new designs inside every collection, always one or more new items which start to be a hit and #musthave. The customers loves it. Here to tell that VIPs , journalists and bloggers loves Gucci too. 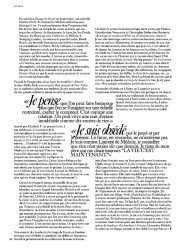 And, yes, about editorials, i saw a lot of Gucci , for example in german Vogue in summer monthes. I love Michele's Gucci from first runway look Alessandro sent to runway in Milan in 2015. I have to say, the comments on the first page predicting that he wouldn't last very long are quite amusing. It just goes to show that you can never predict these things. Laugh at all of them, but I got JW and Hedi stabbing on my back so it doesn't help. Have Gucci finally got a new logo? The latest newsletter and Instagram post would suggest so. ^ Sorry, what was the old one? Gucci has recently seen a sharp surge in sales, as per figures released by the brand’s parent company, Kering. Revenue at the Italian fashion house reportedly rose 37 percent to approximately $2.3bn in the first quarter of this year. The recent rise marks one of the highest growth rates for the company within the last three years. The Gucci brand reportedly performed well in the North American market, seeing a 64 percent rise in sales primarily in the U.S. Additionally, growing demand for luxury goods in the Chinese market has also lifted Gucci’s sales. Gucci has been on the rise with younger consumers since the appointment of Alessandro Michele as creative director in 2015. Recently, the brand has released gender-neutral capsules as well as hyped releases such as the chunky Rhyton sneaker and last summer’s bootleg-inspired T-shirt. Gucci’s success had a knock on effect, with sales in Kering increasing by 27 percent to approximately $3.7bn, including Gucci’s 48.7 percent jump in comparable sales. The luxury French group also owns Balenciaga, German-based PUMA, and Yves Saint Laurent, the latter of which also saw sales rise 12 percent to approximately $498 million. “We delivered a remarkable performance in the first quarter and are confident that our brands can outperform the market in the remainder of the year through innovation,” said Jean-Marc Duplaix, Kering’s Chief Financial Officer. “All this without opening new stores,” he added. Eh, who told him that?? @Fashionstuff was it you? Well, technically it’s a photograph e-mailed to us by the Gucci communications office, taken by the photographers Inez & Vinoodh, altered by a retouching artist named Justin Metz to look like an Interview cover from 1981 of the legendary musician Diana Ross, created by the artist Richard Bernstein — but who’s counting? Augmented reality. Fake news. Alternative facts. It’s a troubling time for seekers of authenticity. Gucci’s creative director, Alessandro Michele, knows this better than most. Since reinvigorating the luxury fashion house when he came on board in 2015, the 46-year-old Italian designer has been working through ideas about dovetailing originality and appropriation. Take, as evidence, Gucci’s recent partnerships with Trevor Andrew, an ex-Olympic snowboarder whose graffiti alter ego, GucciGhost, led to a handbag collaboration; and Dapper Dan, the Harlem-based designer whose Louis Vuitton “knock-up” jacket was copied by Michele into a jacket of his own, which then ended in an unlikely arrangement whereby Dan was invited to design a capsule collection for the house. Confused yet? Imagine how I felt when, on a windy October afternoon, I arrived at the Yuz Museum, in Shanghai, to find giant posters promoting the opening of an exhibition called The Artist Is Present—the name of the wildly contentious 2010 performance piece by Marina Abramović that lasted 700 hours at New York’s Museum of Modern Art. The title of the exhibition aside, the image of a brunette woman on the poster bore an uncanny—but not exact—likeness to Abramović, strange given that Michele and the art-world provocateur Maurizio Cattelan were co-mounting this new show, and that the Serbian artist was, in fact, absent. Inside the gallery, workers in plastic protective booties were putting the finishing touches on a hallway suffused with pink-and-blue light that felt downright Turrellian but was actually created by the artist Kapwani Kiwanga. There was a machine that simulates the human digestive system by Wim Delvoye and self-portraits of Gillian Wearing as her parents. There was even a replica of the Sistine Chapel, one-sixth the size of the original, by Cattelan himself. When my tour was over, I flagged a car to Michele’s hotel to learn more about the power of plagiarism. NICK HARAMIS: What is it about the idea of a copy that interests you? ALESSANDRO MICHELE: Art is about connection. No real artist wants to make a piece and close it in a box so that nobody gets to touch it. In the same way, fashion is about connection. It’s no longer enough to make chic clothes and put them in a boutique. Fashion is supposed to be alive. It comes from the streets, from music, from the club. But to answer your question: This old lady called “fashion” was dying, so designers decided they needed to make the bag of the day. They’d take a piece of art and put it on a bag for no reason. It was just a trick to get people buying. HARAMIS: Yet the overall thesis of this show seems to be that there is creative potential in plagiarism. What’s the difference between an inventive reproduction and a counterfeit? MICHELE: One creates a conversation and isn’t really copying. It would be like saying Mozart copied his compositions because he used musical notes. If I need something to tell my story, I can’t be shy. I don’t care how it comes across, because everything is my truth. I don’t replicate something in my work because I need the replica. I do it because I need the note. Mickey Mouse is a note. Dapper Dan is another note. But a copy for copy’s sake, just to sell a pair of shoes, is really sad. They’ve lost the chance to do something personal, and instead they’ve just made a product. HARAMIS: How do you feel when people copy you? MICHELE: I don’t care. And not like, “Oh, I don’t care—I hate them.” On the other hand, when I look at the people who try to copy me just to create confusion about what’s real and what’s fake, I think it’s a shame because, in a way, it’s like they’re destroying my work. If you try to make the same thing without a soul, it will be trashy and ugly. I’m always trying in a very delicate way to put together things that are dirty with things that are completely clean, things from the bourgeois and things that belong to the ghetto, things that are completely broken with things that are well done. I love when people on Instagram try to find the seed of what I’m doing—even if they’re not always right, they’re often close. HARAMIS: You’re talking about your references for a collection? MICHELE: The Instagram account Diet Prada will sometimes find references in the clothing that I didn’t even think about, which is great because it provides another point of view. HARAMIS: You’re clearly a lover of vintage clothes. In a way, when I look at your collections I feel like I’ve stepped into the most creative vintage shop. MICHELE: That’s why I always say that the last look in any given collection is not really the last one—it was just that I didn’t have more time. I never say that I made a collection because I think this is what the season is like—it’s not true. I’ve just been playing for months. These are the things that came to me in five months, and this is a piece of my perversion during that time. I think that we need to work a little bit more with our guts rather than just stand in front of a color palette. HARAMIS: Do you always have a well of inspiration you can dependably draw upon? HARAMIS: [Pointing at Michele’s nails] I can see that. But why just two of them? MICHELE: Let me tell you a funny story. When I was a little guy, I was always playing with my mom’s nail polish. I was in love with the little bottle and I loved color. When I was trying to choose the right color for the models in the last show, I said, “Red is beautiful because it was the color that my mom usually wore. And it’s so punk.” But because I was choosing from a lot of options, I only had two nails left to paint at that point. And then I noticed how cute it was that I have these really massive hands with two nails painted red. It made me feel so happy and chic because it’s so wrong. I don’t think I did a very good job, though. I’m getting older, and I can’t see if I don’t have my glasses. HARAMIS: Well, I think you did a great job. MICHELE: Not really! I went to art school, and I was really good at painting. I blame it on the brush. Anyway, it’s funny watching people watching me. I can tell you’re sort of hypnotized. HARAMIS: I mean, there’s a lot to look at, Alessandro. MICHELE: [Laughs] There is a lot. My rings are something that I love. I don’t know why. Maybe it’s my way to feel young, to preserve the voice of the kid inside me. To keep that alive. HARAMIS: In some ways, that youthful spirit is comparable to the outlandish and liberating sensibility of camp. News came out today that you and Lady Gaga will be among the host’s for this year’s Met Gala, which is centered on the idea of camp. MICHELE: Embracing camp is like having a conversation with a part of you that’s normally kept hidden. I feel like I’m always fighting with a lot of Alessandros inside me. These crazy conversations help me feel alive, which is important, otherwise I’d just be a fashion designer. That would be like putting myself in a tomb. It would be like saying I am just the boyfriend of someone else…that’s it. I’ve been with my boyfriend from almost 11 years, and people keep saying, “You need to get married to him.” I’m always thinking, “But why? I want to feel free to break up tomorrow.” It’s also the way I feel about working for Gucci. I don’t care if tomorrow will be the last day, and that’s freeing. Otherwise I’d just be working to keep the position, which inevitably is not sincere. HARAMIS: Does that mean you don’t put a lot of pressure on yourself each time you make a new collection? MICHELE: I never feel the need to say something new. It’s new just by the way I say it. It’s new because it occurs in the right moment. If I read a poem in front of you now, even a really old one, it would be new for us even though it’s not. HARAMIS: I’ve heard you say that you don’t care about the future. MICHELE: I don’t. I mean, come on. I’m not god. You could think that I’m the coolest and most attractive fashion designer, but I’m not unique. I’m only unique because I’m me. Just like you are only unique because you’re you. I’m not a diva. HARAMIS: Given that, when you first entered into the world of fashion, did you feel totally at home? MICHELE: No. But I feel at home now, because I’ve known the people I work with for a very long time. I feel at home in this company because there’s such good energy here and because they’ve given me the power to say something. The first time I went to the Met Gala, I thought, “This is just a group of human beings—just like me, just like everybody.” I’m never going to be the kind of guy who’s always in Saint-Tropez. No matter what, I feel like such a little villager. HARAMIS: You were born in Rome. What were you like as a kid? 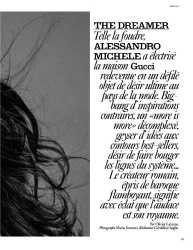 MICHELE: I was really eccentric. I changed the color of my hair when I was 11. MICHELE: This really bad blonde. HARAMIS: I frosted my tips, because of that damn Pacey Witter on Dawson’s Creek. MICHELE: I locked myself in the restroom, and when I came out, my dad said, “You look so bad.” I grew up in an area that wasn’t exactly the most appropriate place for a guy like me. I fought a lot to be who I was, and who I am now. The way I looked was an affirmation of my identity. My hair, my shoes, my pants—each part was like a war. Every day. I was kind of a masculine, sporty guy, but there was always something feminine in me. I was in love with dark music, and I felt like kind of a rock star. I remember when I came out to all my heterosexual friends, I said, “I think that I’m in love with a guy.” I was so unprepared to have that conversation, but even as a kid I’ve tried to be sincere with the people around me. It’s the same to this day. I’m still fighting with myself, with all the things in me and with all the things that surround me. I want to disturb people, but in a nice way. "On the other hand, when I look at the people who try to copy me just to create confusion about what’s real and what’s fake, I think it’s a shame because, in a way, it’s like they’re destroying my work. If you try to make the same thing without a soul, it will be trashy and ugly. I’m always trying in a very delicate way to put together things that are dirty with things that are completely clean, things from the bourgeois and things that belong to the ghetto, things that are completely broken with things that are well done. " modela, dodencebt, EstefaniaAbaddon and 1 other person like this.